Ahh, this sounds so great! I know I said I don't read a lot of novellas (none to be exact), but I really want to start reading them - they were just too difficult for me to get hold of it they weren't in print, but now I can get digital copies so it's fine...I really want to read this! Especially considering how The Madness Underneath ended! Thanks for the great review Cora! Also, thanks for hosting the awesome giveaway! Sharing a love of reading is definitely important - definitely something I hope to pass down to any children I may have in the future. Yay! Thanks for the chance. Sounds awesome. Great review. I love books with such premise so this one seems like my kind of read. Thanks for the giveaway. I think sharing a love of reading is so important but it has to be done in the right way. Something so enjoyable shouldn't be forced on anyone but it can gently be encouraged. 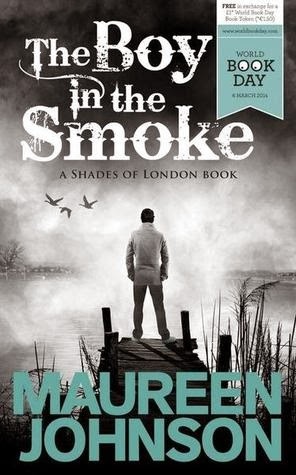 I loved Shades of London and holy god I'm dying to read The Boy In The Smoke your review made me want it some much more! Thanks for having such a stella give-away!